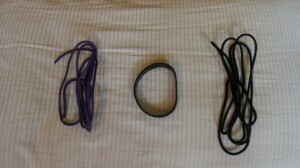 Similar commercial products: Ezekiel Band, various paracord “survival bracelets”. 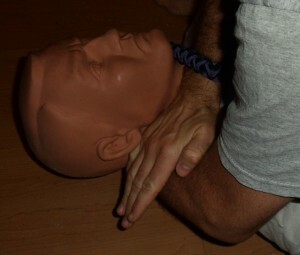 If you train in BJJ or Judo, you have almost certainly encountered the “Ezekiel choke” (aka “Ezequiel choke”, aka Sode Guruma Jime, aka “sleeve wheel choke”). It’s a rather sneaky but very effective choke typically done using the sleeve of the gi, which can be landed from a number of positions. 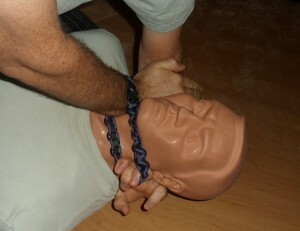 There are versions of the choke that are done without a gi, but they are not nearly as easy to apply. An obvious solution would be to substitute a strong wristband or bracelet for the gi sleeve. 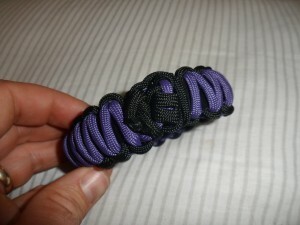 One such example is the “Ezekiel Band“, a slightly modified paracord survival bracelet. Paracord is a good choice here because it is very strong and is easy to weave into a wide variety of different bracelet sizes and designs. 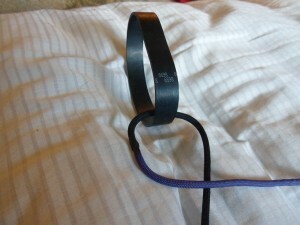 You’ll note that the “Ezekiel Band” linked to above has a clasp/buckle, as do most survival bands. 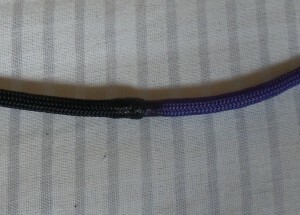 However, for choking purposes, it is preferable to have a bracelet without a buckle that could break, and to have some additional stretch to allow the fingers to get in under the band easily. With those points in mind, I decided to make a version that has a very strong rubber core and no buckle. 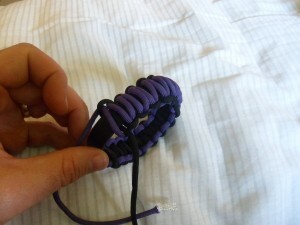 In addition to the paracord (in this case, we’re using two colors), you will need a strong rubber band. Here, I used a drive belt from a vacuum cleaner. These are available in several sizes from most hardware stores and are not expensive. 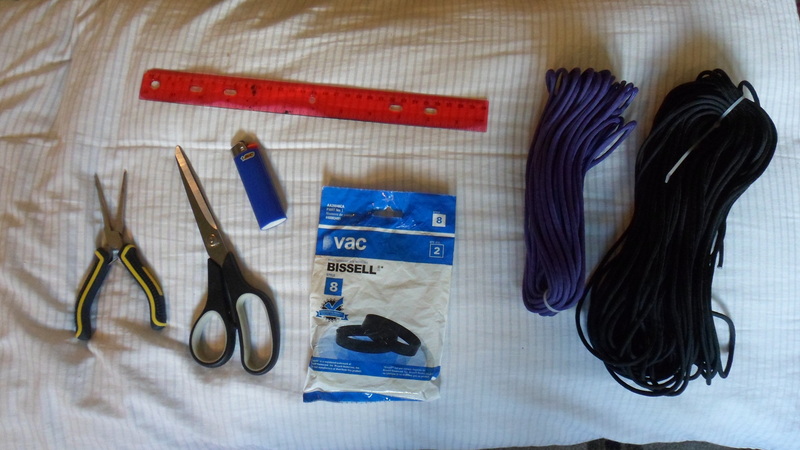 You will also need a ruler, some scissors, a lighter, and some needle-nose pliers. The only difference in our case is that we are not using a buckle and won’t have the two inner strands to wrap the weave around. 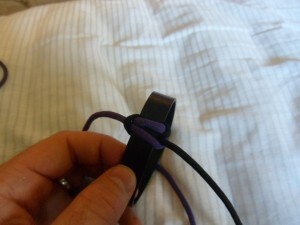 Instead, we’ll be using the rubber band in place of the inner strands and just weaving the whole way around. 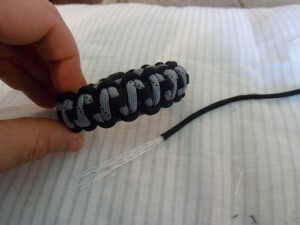 To get started, just put the paracord (fused as in the video if you are using two colors) through the rubber band, and make the first stitch just like you would if the rubber band were the two inner strands in the video. From there, it’s just a matter of completing the rest of the stitches, pausing occasionally to push the completed stitches together/pull the rubber out from the existing stitches in order to keep everything tight by reducing the space between stitches. When you get to the end (or back to the beginning, as it were), you will need to join everything together. 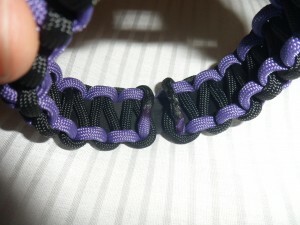 The easiest way is just to use a free end of paracord to tie things together, or to use an extra piece of paracord for this purpose. 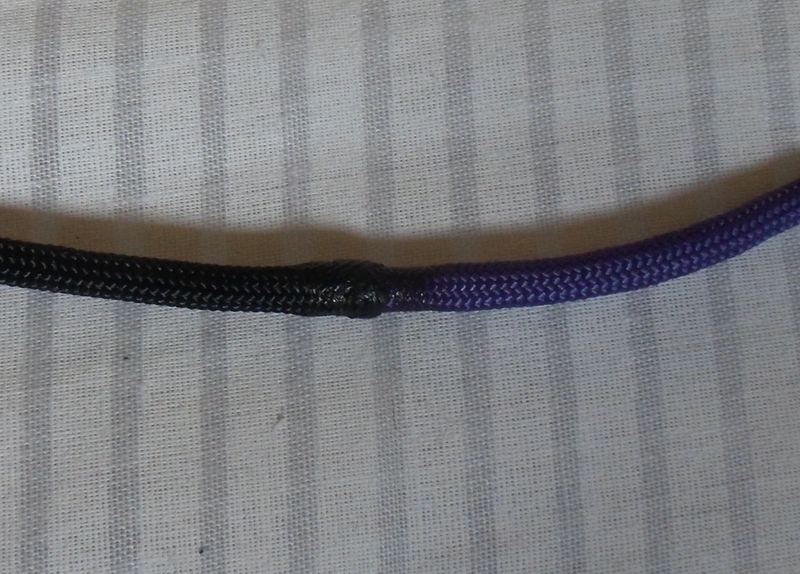 You can melt the paracord to ensure that there are no frayed ends and nothing comes loose. Here’s just a quick tie-up job to join the ends together. Obviously, it can be made to look nicer than this with a little more effort! Time to test it out! 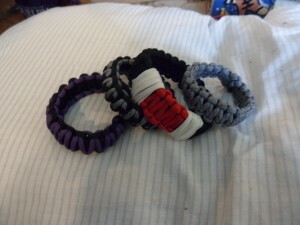 Here are some other weave designs. There are tutorials for making most of these available online — just decide which you like and do a search. You can also check out some very good YouTube channels for ideas, such as Survival Pax, Tying It All Together, and Bored? 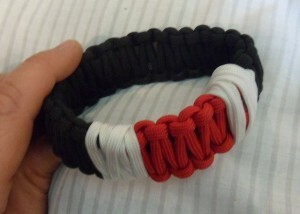 Paracord!. Go ahead and get creative. And be sure to share your ideas in the comments!